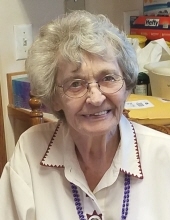 Viola Van Horn Holland passed away Saturday, February 2, 2019, at the age of 86, from complications of a stroke. She passed away peacefully surrounded by family at the Peace Hospice House. No service is planned at this time. A memorial will be held this summer. Viola was born to Charles and Anne Van Horn on June 21, 1932 in the Stockett, MT area and spent her childhood in Eden, MT. She attended elementary school at the Calvert school. She attended 1 year of high school in Simms and graduated from Great Falls High in 1950. Viola met Jack Stanfield while attending school in Simms. They married in 1950. They had 1 son, Steve, who was Viola’s world. In 1957, they left the Fort Shaw area and moved to Geyser to begin farming and ranching. Viola raised Charolais/Hereford cross cattle. She was known to have some of the heaviest weights in the county. Viola loved ranching, especially her cows. She had names for most of them. A friend in the area once said when they died they wanted to come back as one of Viola’s cows. Viola retired from the ranch and moved to Geyser where she helped raise her grandson, Michael Stanfield. Jack and Viola had very good neighbors and enjoyed camping and fishing with them. Jack and Viola divorced in 1972. Family and friends were very important to Viola. She enjoyed calls and visits from her grandkids and her good friend, Lois Wirtala. Lois and Viola were friends very early on until her death. In 1974 she married Wallace Holland. They later divorced in 1998. While living in Geyser, Viola met Jerry Akre. They had a beautiful relationship until his death in December 2018. A special thank you to Desserae Stanfield and Freda Karjala who provided loving care to Jerry and Viola until her death, Geyser EMT’s, and the staff at Peace Hospice. Survivors include Viola’s son, Steve Stanfield of Geyser, MT; her grandchildren Michael (Desserae) Stanfield of Great Falls, MT, Sandra Sleeper of Bullhead, AZ; and great grandchildren Michael and Araya. Viola was preceded in death by her parents, her 3 brothers Samuel Drazich, Dan Drazich, and Raymond Van Horn, and her significant other Jerry Akre. Memorials are suggested to the Geyser EMT’s or Geyser Senior Citizen Center. To plant a tree in memory of Viola Holland, please visit our Tribute Store. "Email Address" would like to share the life celebration of Viola Holland. Click on the "link" to go to share a favorite memory or leave a condolence message for the family.